9 June 2016. The ExplorOz Traveller App is ideal for iPads, iPhones, Android phones and tablets and was released late yesterday on the App Store and Google Play. Read on for details. Navigating the Canning Stock Route, as Easy as Finding that Restaurant? The drive may be a bit different, but our new app called ExplorOz Traveller aims to make navigation in some of Australia’s most remote regions just as easy as in the city/suburbs. And although the app can’t make the terrain easier, it will let you know the difficulty level so you don’t get stuck! The app is ideal for iPads, iPhones, Android phones and tablets and was released late yesterday on the App Store and Google Play. This is the first app in Australia that gives you offline auto-routing for trips such as the Canning Stock Route, Flinders Ranges, Simpson Desert, Kidman Way, Cape York, Tanami Track, Gunbarrel Highway and many more. These routes are complete with photos, trip notes including difficulty & vehicle requirements, places to see, camp sites, permit needs, and best times of year to visit an area, as well as fuel usage estimates (and where to fill up). ExplorOz Traveller also allows you to access and contribute to the largest verified POI list for campers & caravanners. These POIs are visible on the map whether you are offline or online, enabling you to always discover new Places around you. You don't ever have to worry about having the right maps or guide books - it's all in the app! The app displays three types of maps; street, satellite, and (topo)graphic, with the topo map available both online and offline. All maps work seamlessly in the app and include navigation tools to enable you to obtain driving directions to anywhere in Australia. The topographic mapset is the well-respected EOTopo™ that has zoom controls to change scale when online or offline. The optional Premium offline map pack allows you to view the most detailed scale to see terrain, contours, 4WD tracks, walk trails, and everything you need to find your way in the outback with confidence. The app is the only way for travellers to run EOTopo maps without a third-party mapping software program and specifically assists iPhone/iPad users who have not previously had such an easy option to access the ExplorOz bundle of offline navigation, mapping, and tracking tools. The app can also record and plot your movements on a separate map for live viewing, sharing or saving. During your trip, selected family and friends can access your map complete with details of your overnight stops. ExplorOz Traveller ensures that everyone can tackle outback trips with confidence – knowing that they are educated on the unique requirements of this type of travel, and have the ability to find what they need on the go. What’s more, keeping the data in the app up-to-date can be done free, and on demand. 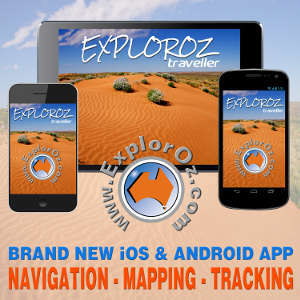 COST: ExplorOz Traveller cost AUD$59.99 and is available now from the App Store and Google Play. The Premium Map Pack is AUD$49.99 and Track Logger is AUD$29.99 (available by in-app purchase). NOTE: Many of you will not require the in-app purchases. Track Logging is automatically enabled (free) for Members; and the Premium Offline Map Pack is automatically available (free) if you are a registered owner of EOTopo200K having purchased from ExplorOz on either SD/USB/Download. See App - ExplorOz Traveller section on the ExplorOz website for more details. Our newsletter is distributed to 41,353 subscribers on a weekly basis.